I was talking with Lee Connally owner of the Grill at Ryan Ranch the other day and checking out his great specials for New Years Eve dinner, and the conversation got around to Gift Cards. Lee had a great Christmas till New Years special on Grill Gift Cards. He was running a $100 card special for only $90.00 if purchased there at the Grill. Lee has found that a Gift Card program is much more effective that a gift certificate because the cards are so convienant and are standardized for the consumer. While some gift card companies will work through your pos or credit card company and will manage inquiries and reload value through their customer service for a fee, Lee purchased a stand alone program with the customer service number on the card being the restaurant themselves. This way he is personally handling any issues directly with his customers. Studies show that people spend more on gift cards than on gift certificates. The average gift card denomination in 2004 was $50 -- twice the amount people would spend on the average gift certificate. There’s a number of websites that will offer you a deep discount, up to 50% off if you purchase restaurant gift certificates online. In fact at Restaurant.com there are nearly 3 dozen Central Coast restaurants participating including a $100 gift card for the Highlands Inn for only $40.00! Back to the Grill, on New Years Eve with seating until 8:30 pm and for $35.95 per person you can start with a choice of their Signature salad, Caesar salad or Shrimp Bisque followed by your choice of entrée from Fillet Mignon, Mahi Mahi, Rack of Lamb, Portabella Mushroom Stack, or Dungeness Crab Stuffed Prawns with all the fixings. Archaeologists have found peas in ancient tombs, at Troy (1450 BC) and at Thebes, but no one knows for a fact exactly when people began cultivating them. It may have been as early as the Stone Age. Records indicate that by the Bronze Age (3000 BC), some variety of peas was part of the diet. According to legend, the Chinese believe that emperor Shen Nung (called the Chinese Father of Agriculture) discovered the pea nearly 5000 years ago. By the Middle Ages, peas were stored, dried, used, for Lenten eating and as a hedge against food shortage and famine. Because the dried pea kept indefinitely, it accompanied the English colonists on their way to America. It was one of the first crops planted by the colonists. Late in the 17th century, colonists began to regularly eat peas fresh. Vigorous breeding programs in Europe and the United States led to peas with improved vigor, disease resistance, flavor, keeping qualities, and higher yields. The biggest advance, however, occurred in 1970, when Calvin Lamborn, a Ph.D. plant scientist working on breeding new shell peas for commercial food processors, discovered an unusual pea plant in his field, what would come to be called an a snap pea. Lamborn saved some of the seeds and continued to select from the subsequent plants. After undergoing rigorous testing in All-America Selections trials, ‘Sugar Snap’ won a Gold Medal in 1979 for its introducers. 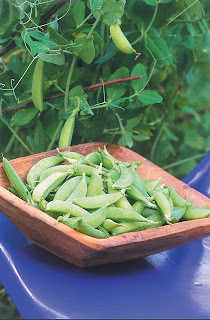 This plant type is named edible - podded peas or snap peas. Peas grow well in almost any kind of soil but they do best in a fertile, somewhat sandy soil with good drainage. Peas, like beans, are legumes. Legumes have the ability to fix nitrogen in the soil, which makes that important nutrient readily available to other plants. With the help of a bacterium that lives in a symbiotic relationship in nodules formed on the roots of the plants, the plants “fix” the nitrogen. The nodules store any excess nitrogen and, as the roots decay, release it into the soil, benefiting plants growing nearby. Pea plants also produce long root systems, which help to loosen the soil as they reach out for moisture. Spent plants decompose into organic matter to further enrich the soil. At the end of the season, simply dig the plants into the soil -- no need to add them to a separate compost pile. My Snap Peas and Blue Lake Beans are mostly running along the fence line. They start from behind my tomatoes on the first level, then they run up the hill along the fence on the second level. I may stick a couple in along a walkway next to the lawn. They create a really nice texture in the landscape, and its nice to be able to walk along and pick fresh young pods to munch on in the garden. Bring large pot salted water to boil. Add green beans and boil, uncovered, until slightly tender but still crisp, about 3 to 4 minutes. Drain and set aside. In large saucepan over moderately high heat, heat 1/2 cup olive oil until hot but not smoking. Add onions, garlic, bay leaf, and chile pepper. Sauté, stirring occasionally, just until soft, about 4 to 5 minutes. Add green beans, chicken stock, vinegar, salt, pepper, and remaining 1/2 cup olive oil. Bring to simmer, then reduce heat to low and simmer, covered, 30 minutes. Strain, remove chile and bay leaf, and serve immediately. According to the USDA, the American 'cranberry bean' is the same bean as the Italian 'borlotti' and, as a matter of fact, a large percentage of the 'borlotti' beans sold in Italy are actually 'cranberry beans' imported from the U.S.
Another name for this bean in the U.S. is 'French horticultural bean'. If you can't locate cranberry beans, an acceptable substitute is the pinto bean, and a second (but not as close) substitute would be red kidney beans. These beans are related to the Tongues of Fire Beans. Very popular for Spanish, Italian and Portuguese dishes. They are ivory in color with red markings, sometimes red with ivory markings. Place Cranberry beans in a pot of water and bring to a boil. Turn down to simmer for 20 minutes and then drain. While the beans finish simmering, heat about 3 tablespoons of Extra Virgin Olive Oil and brown the eggplant. Add the Onion and cook until it softens, add the garlic and cook until onions are soft and garlic is fragrant. Turn up the heat and add Cranberry Beans, tomatoes, olive mix, vinegar, and herbs. Stir well, turn down to simmer for 10 minutes and serve. Great hot as a side dish or cold as a salad. When cooked ,Salsify resembles an oyster. It is long in length and is white in color on the inside. It is packed in a 5kg carton. Typically out of Belgium and used most commonly in soups and stews. 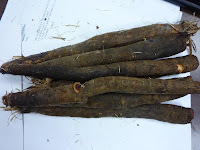 The root is also known as Goatsbeard or Oyster Plant. A Beverly Hills doctor turned the fat he removed from patients into biodiesel that fueled his Ford SUV and his girlfriend's Lincoln Navigator. Fat--whether animal or vegetable--contains triglycerides that can be extracted and turned into diesel. Poultry companies such as Tyson are looking into powering their trucks on chicken schmaltz, and biofuel start-ups such as Nova Biosource are mixing beef tallow and pig lard with more palatable sources such as soybean oil. Mike Shook of Agri Process Innovations, a builder of biodiesel plants, says this year's batch of U.S. biodiesel was likely more than half animal-derived since the price of soybeans soared. 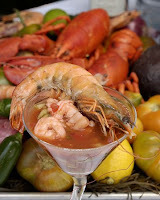 Italian fishermen developed this Cioppino recipe in the mid 1800's. There are two versions of where the name "Cioppino" came from. Most believe it's based on an Italian soup called "ciuppin." A more colorful version is that the fisherman used to gather after the day's work was done and all throw different pieces of fish and seafood into a communal pot for supper. They would call out to each other in broken English "chip in," "hey you, chip in," and this was the actual root for the word Cioppino. In a large pot, on medium-low heat, melt the butter with the olive oil and sauté the celery and onions until soft, about 10 minutes. Add all the rest of the ingredients except the seafood and fresh parsley. Simmer on low, uncovered, for one hour. Add a splash of water if the sauce gets to thick. Taste for salt and adjust if needed. Add the crab, shrimp, and halibut, and simmer covered another five minutes. Add the mussels,cover the pot and simmer for 3 minutes more, or until the mussels open. Turn off the heat, and stir in the Italian parsley. Ladle the Ciopinno into large bowls and serve with lots of sourdough bread and red wine. Stock Yards Meat Packing Company™ knows steaks. For over 110 years, we have provided quality, gourmet beef, lamb, pork and veal. The Stock Yards® brand was founded in the Chicago stockyards in 1893 and has set the highest standards for quality, consistency, integrity and most of all, service. Our customer base has since grown from the neighborhood families to some of the finest hotels, resorts and clubs in the country. To maintain our tradition of excellence, we understand the importance of outstanding service to our customers. Over the years, the Stock Yards® reputation for providing premium beef in the foodservice industry has become well known to operators and chefs alike. With an attention to detail and an emphasis on customer service, the line has grown to cover all of your “center of the plate” needs. The Stock Yards Meat Packing Company™ pioneered the concept of offering carefully selected and aged beef to customer’s specifications. In the 1950s, we became the first company in the hotel/restaurant industry to offer hand cut, portioned steaks. Soon after, we joined an elite group approved by the USDA to offer USDA Prime and USDA Choice steaks. Our history has allowed us to develop quality specifications, unparalleled in the industry. Today, each Stock Yards® steak is hand selected and cut for close trim and uniform thickness to provide the best possible plate presentation. All beef is carefully and naturally aged to produce the ultimate level of tenderness, juiciness and flavor. Only native cattle, known for their larger muscle mass and greater marbling qualities, are used. Stock Yards Meat Packing Company™ only purchases from packing plants that have been inspected by a quality assurance team with specifications that exceed the USDA standards. Stock Yards Meat Packing Company uses the latest technology to vacuum seal fresh cut steaks. Our specifications call for each steak to be individually packaged. However, accommodating our customers is our primary concern. Although our emphasis is on a fresh cut program, our facilities are well equipped to handle a quality frozen program, or to pack in bulk. All of our bone-in steaks have a bone guard to protect packaging and provide the best steak possible. Working together, our facilities offer the best aged, corn fed beef on the market. Each facility, located across the country, is USDA inspected— that’s the law—but on top of that, our own quality assurance team ensures our standards are being met. It has been said that the fine art of butchering is a thing of the past—not at Stock Yards Meat Packing Company™. We employ expert meat cutters so you don’t have to. We have the experience and desire to develop and utilize training programs and apprenticeships to preserve this fine trade for generations to come. At Stock Yards Meat Packing Company™, we understand the emphasis you put into your "center of the plate” presentations. As such, we are committed to having the best trained staff of butchers so your chefs can do what they do best—create! Today, we have grown into an internationally recognized company, known for our dedication to selling only the highest quality meat products available. All over the world, chefs, foodservice operators and managers know that if the name says Stock Yards®, it's nothing but the best. specifications for each step of the process. Our quality assurance teams ensure compliance. The result: the best cut steak available to your customers. Wet aging is the Stock Yards Meat Packing Company's standard process. Dry aging is also an option to our customers; however, our cut shops must be contacted in advance in order to utilize this process. The principle difference between these two aging processes is wet aging takes place in the vacuum sealed bag, whereas dry aging is taken out of the vacuum sealed bag and placed on a rack in the open air. Either way, the aging process occurs naturally, inside the muscle structure. It is critical in both techniques to maintain temperature at 34 degrees (F). Additional factors must be in place to ensure that dry aging occurs properly. Because the product is now out of the bag, the room must have relative humidity of 82 to 85%. excessive shrinkage and a dryer product. Another important factor is airflow. The airflow in the controlled environment must be kept moving to ensure maximum yield and finish. Dry aging is thought to produce an acid-like or tart flavor. Others describe it as a nut like flavor. If there is too much moisture or not enough airflow, then the chance for mold to grow on the product can occur. This will impart it’s own set of flavors. In the beginning, dry aging was the only conditioning process, but with technological advancements, wet aging has become a viable option. Also consider that back in the days of beef on the rail, the whole side was dry aged. Today, we dry age subprimal cuts, which involves more surface area and additional trim. Dry aging will also have additional shrink and trim loss. The debate continues as to which process is better. The answer lies in personal flavor preference and economics. Stock Yards Meat Packing Company™ assures it’s customers that every step of the process is monitored for quality control and maximum yield. Our goal is to provide you with the resources to give your customers the best dining experience possible. Together, we can create memories. Using over 110 years of tradition, pride and consistency, our cut steak program covers every detail to ensure that your customer has the finest dining experience possible. From hand selecting each cut to aging our beef before it’s trimmed and cut to rigid specifications, our premier cut steak program is designed to give customers the flexibility to develop any concept. A variety of styles combined with every size imaginable, not only includes beef but Pork, Lamb and Veal. We are committed to giving you 100% yield so you may concentrate on your menu. • Founded in 1893 in the stock yards area of Chicago, the Stock Yards® brand has set the highest standards for quality, consistency, service and integrity. • All beef is carefully and naturally aged to produce the utmost level of tenderness, juiciness and flavor. • Only “Native Steer Cattle” known for their larger muscle mass and greater marbling are purchased. DeNiro Cheese is recalling approximately one pound of Sopressata sausage products that may be contaminated with Listeria monocytogenes, USDA announced on Friday. Subject to the recall are 12-ounce approximate weight packages of "Nostrano SOPRESSATA MILD SAUSAGE, PRODUCT OF CANADA." Each package bears a use-by date of "07/09/09" and a product code of "91009" as well as "CANADA 476A" inside the Canadian mark of inspection. The sausage product was produced on Oct. 9 and sent to Italian specialty retailer Lariccia's Italian Market Place in Boardman, Ohio. SF Beer week is coming up in February. Running from the 6th-15th (Yeah, I counted 10 days in that week) it will feature beer events from "The City" down into the South Bay and Monterey. The guys from Uncommon Brewers will be hosting a 5+ course dinner with beer pairings, prepared by Todd Williamson of Nepenthe in Big Sur dinner at the Red Lounge in Santa Cruz. On February 13th Trailside Cafe in Monterey will be hosting a beer dinner from 6-9pm. Join the River Road Wineries for The Sweetheart Of All Wine Tastings! 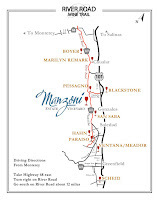 The twelve vintners along Monterey’s River Road Wine Trail want to share the love! Make your plans for this special day of rare vintages, fun, food, and celebration all things amour. As a Passport-carrying V.I.P., you’ll receive a souvenir glass, custom chocolates, entry into a grand drawing, and special discounts. The passport “ticket price” of $25 (only $20 if purchased before February 1) includes day-of-event gifts and drawing eligibility. Passports go on sale on this website Monday December 22. If a $20 dollar passport ticket price is too much to entice you to visit these River Road wineries, why not try to attend the SpringFest with a ticket price of nothing dollars, which makes a lot of sense. From 11 am to 4 pm. Free admission, no reservations required. The 15th annual SpringFest takes place May 2nd and features new releases, barrel sampling, food, and entertainment at our member wineries. Contact the individual wineries for their scheduled activities. See you there! Please note: Ventana will be holding their open house at their winery location at 38740 Los Coches Road, Soledad. Please note our next Serv Safe class is February 11th. If they are interested, have your customer complete the attached registration form and send it over to Abraham Wilson. According to Chuck Brown, Facility Coordinator at US Foodservice San Francisco They have now saved 1 million kilowatt hours, over last year to date numbers. To put this into perspective, they saved enough energy to power 200 homes for a year. That's equivalent to removing 32,722.00 cars, and one moped off the road. Congratulations, to US Foodservice San Francisco, the only Food Distributor that is a Bay Area Certified Green Business. Preparation: Combine all ingredients in medium pot and simmer, uncovered, over medium heat for 20 minutes, stirring frequently, until mixture thickens. Take care to avoid scorching. Presentation: Puree in blender until smooth. Mix together salt, pepper, cumin, chili powder, and cinnamon and massage into tenderloins. Heat Olive oil almost to smoking in cast iron pan and sear tenders on all sides. Roll Tenders in mix of sugar garlic and tabasco and finish in the pan in the oven. The Certified Angus Beef ® brand posted sales of 634 million pounds in 2008, the highest mark in its 30-year history, the Wooster, Ohio-based company announced. The increase was 51 million pounds, or 8.8 percent, over 2007 sales. Licensed retailers increased sales by more than 10 percent, selling more than 318 million pounds, CAB reported. The foodservice division increased sales by 4.5 million pounds, for a total of 213 million pounds. More than 14.2 million head of cattle were identified for the brand — an increase of more than 750,000 head in the past year — and 2.5 million head certified. Acceptance rates rose to 17.8 percent. The No. 1 Top Sales Volume Broadline Foodservice Distributor, U.S. Foodservices Inc. / Stockyards Meat Packing Co., Phoenix, Ariz., places intense focus on the brand. This Multi-Platinum Club member is a sales leader of middle meats, end meats, value-added products and grinds. Customer tours and trade magazine articles add to its day-to-day sales efforts. The company is equally dedicated to assuring the integrity of the brand. "This has been a remarkable year, and the accomplishments have been many," said John Stika, president of Certified Angus Beef LLC. "This achievement speaks to the integrity of the brand and the decades of success our licensed partners have had in providing consumers a high-quality product." This USDA Certified Stockyards Angus Beef Program was launched this week in the San Francisco Bay Area. This Premium Beef Program features 12 items available for next day delivery up to 6 days per week. What makes this program special are the rigid specifications. The cattle are all Mid-Western grain fed cattle. They are USDA inspected, graded in the upper 2/3rds Choice range and USDA Certified. Proper aging equals time and temperature controls. All meat is wet aged in vacuum sealed bags at 34-36 degrees. All meat is aged to the minimum requirements for maximum flavor and tenderness. “Restaurants aren’t just counting pennies at this point; they’re counting half-pennies,” says Jim Balis, president of The Restaurant Management Group, a New York City-based turnaround-management company that advises restaurants on cost-cutting strategies and coaches them out of financial trouble. Balis offers three broad strategies for operators in all sectors. 2. Tie bonuses to savings. Another tactic that Restaurant Management Group has found worthwhile is offering heavily weighted bonuses to managers. Discuss with managers in advance what the key indicators will be; for example, if china costs are high, decide that for the next two quarters, manager bonuses will be based on reducing the number of replacements. 3. Improve the guest experience. Balis notes that many chain restaurants are relying more on “eatertainment” to help improve the guest experience. This strategy, which could involve assembling ice-cream sundaes tableside rather than in the kitchen, engages customers (as well as servers) at no extra cost. Preparation: Combine ingredients and shake well, serve over ice, garnish glass rim with salt and limes. Carmel by the Sea at Christmas is something worth experiencing. At night Christmas lights, licked by fog, strung around funky shaped architecture up and down its winding roads is really magic. Wondering down Ocean Avenue listening to chatter from restaurants and the sound of the ocean in the background completes the scene. I had the opportunity to recommend some local restaurants to a group of about 70 from US Foodservice San Francisco last weekend, and among others I recommended Christopher’s On Lincoln in Carmel. Chef/Owner Christopher Caul opened his namesake restaurant in early 2004. 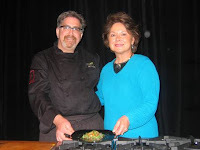 I knew Christopher from when he was working with Jon Kasky and Nancy Rohan at Paradise Catering in Carmel Valley. 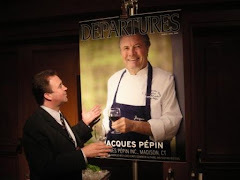 Before that he had owned and two or three restaurants as well as doing time as a Chef at Pebble Beach. I’ve been to Christopher’s many times and, most recently was there during the soft-shell crab season. Chef does great things with soft-shells. I also love to be surprised with the risotto of the day. Being only open for dinner allows Chef to spend the morning shopping for fresh, local ingredients before heading to the kitchen to work on the specials of the day. Not only did I get to refer Christopher’s last weekend, but I was invited to dinner with the Steve and Melody O’Shea group of 13! We were one of the earlier dinners to arrive at the restaurant at a few minutes after 6pm, and were seated at the very back wall of the restaurant, that probably seats about 65 or so people maximum. Within the next hour every seat in the house was full. Our server was attentive and professional, up selling but not pushy. “Shall I bring you two bottles of wine or just one?” We started off with some of Christopher’s favorites Pan-Fried Green Tomatoes with basil, parmesan, romano, roasted garlic & fresh Tomato sauce, Butternut Squash Ravioli with brown butter and fresh sage. 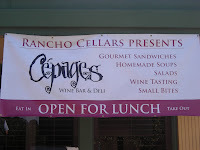 The menu features 13 entrees and 11 salads and starters. His tequila and lime cured salmon is nearly legendary. But it is hard to order off the menu when he has 6 or 8 “house specials on any given night. I ordered the Loch Duart Salmon prepared like the swordfish, just like my server suggested, with French lentils, apple-wood smoked bacon, wild mushrooms & braised greens. The Braised Niman Ranch B.B.Q. Beef Short Ribs with roasted garlic mashed potatoes & braised red cabbage would have been my second choice, but since David Bates Business Development Manager ordered that, and his plate was within forks length I figured I could steal a bite or two by distracting him with the ever popular “look isn’t that Clint Eastwood” ruse. As we finished dinner and waited for dessert the O’Sheas had most of the table trying to perform cork magic tricks, and hanging spoons from their noses like we were in someone’s home rather than the middle of a restaurant. Chef Chris came out several times to make sure his guests were enjoying themselves; he need not have been concerned. Eating at Christopher’s is like hanging out with friends at Chris’ place, enjoying something he whipped up after a find at the farmer’s market. And I haven’t even mentioned the fantastic cocktails. Get to the Monterey Peninsula for the holiday’s and put Christopher’s On Lincoln on the “to do” list. French Fries, at least in the U.S. seem to have been first named “Potatoes, fried in the French manner”, which is how Thomas Jefferson described a dish he brought over to the colonies in the late 1700s. He served this to guests at Monticello and it became popular dinner fare. The Oxford Dictionary of the English Language makes first mention of them in an 1857 quote from Dickens about a plate of potato sticks cooked in oil. There are also a couple references in the late 1800s. The potato is made up of two elements-water and potato solids. The raw potato used in making French Fries is, on average, made up of 80% water and 20% solids. These two factors are determined by several other factors. We will only be focusing on the two main and most important factors. • Growing Conditions: When growing potatoes you must have proper soil conditions and strict agriculture practices, which refers to the tracking of fertilizer and pesticide applications to the crop. Water application and Mother Nature impact the potato size, solids and water content. • Processing of Potato Products: With Low potato solids, a manufacturer can produce what is called a “budget fry”. A manufacturer can leave most of the moisture in the potato during the process. Water weighs more than potato solids, so with higher moisture content you will get less French Fry per case. Remember the old saying, “You get what you pay for?” in this case you get less! 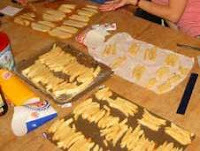 A high solid French Fry is where the manufacturer has taken a majority of the moisture out of the French Fry before it is frozen and packaged. Remember, water is heavier than potato solids, so with more water removed, we will have more French Fries per pound, and more servings per case, which translates into more profit per case. Also a dryer or higher solid potato takes less time to cook because there is less water to cook out. Less water means less contamination in the fryer oil and longer holding time. A budget fry will cost you more in labor also because it is going to take longer to cook out the moisture, and it will require more fries to be cooked to equal what a higher solid fry would have produced. We get additional servings by purchasing high quality fries, which equals less waste, more profit and happier more satisfied customers! At First glance the $5.00-$6.00 per case savings by purchasing a bargain fry seems like a good deal, however the yield costs don't add up. Quite frankly a longer french fry is better. Longer fries provide better plate coverage. Bargain fries will have more short strips, which can be a hidden cost to you. Remember profitability is pounds translated into number of servings. We get additional servings by purchasing high quality fries, which equals more servings, less waste, more profit, and happier more satisfied customers. In a french fry comparison cutting this week we opened, counted, and cooked 5 cases each of an extra long, low moisture french fry versus 5 cases of line flow french fries. That is $132.50 more profit, by using the higher priced fry, for every 5 cases sold. If even an average volume restaurateur is selling about 15 case per week that equals $397.50 per week, or $20,670 per year..in additional profit! *Serving used for this test was 1/3 lb. Patience is the key to making this flavorful pâté. Before it is assembled, the ingredients should marinate overnight, and the finished pâté should set for at least a day after it's cooked so that the flavors meld. 1. Cut the duck breasts into 1⁄2" cubes. Transfer duck, 1 finely chopped clove garlic, orange liqueur, 1 tbsp. of the olive oil, and 3 torn bay leaves to a small bowl; stir to coat the duck pieces. Cover and refrigerate for at least 1 day and up to 3 days, to allow the flavors to come together. (The longer the duck marinates, the better the pâté will taste.) Cut the pork shoulder and the fatback into thin sheets. Cut sheets lengthwise into 1⁄8"-wide strips. Cut strips crosswise into 1⁄8" cubes. Mound the pork and fatback into separate piles on the cutting board and finely chop them by running a chef's knife over the piles several times; transfer pork and fat to bowls and set aside in the refrigerator to let chill. 2. Meanwhile, in the bowl of a food processor, finely chop the remaining garlic. Scrape the sides of the bowl with rubber spatula. Add chicken livers and pulse until puréed. Add reserved pork and fat. In short bursts, pulse until the mixture resembles coarse hamburger meat, about 20 pulses. 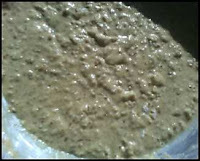 Transfer pork–liver mixture to a large bowl. Add eggs, chopped thyme, cloves, ginger, nutmeg, piment d'Espelette, and salt. Mix the ingredients together with your hands until well combined. Test the mixture for seasoning by heating remaining olive oil in an 8" skillet over medium-high heat. Transfer a pinch of the mixture to skillet and cook, flipping once, until golden brown, about 3 minutes. Taste; adjust seasoning accordingly. Cover bowl with plastic wrap and refrigerate for at least 1 day and up to 3 days, to allow the meats to cure and the flavors to come together. 3.When you're ready to assemble the pâté, remove bay leaves from duck mixture; discard. Using a spoon, fold duck mixture and any juices from marinade into the forcemeat along with the pistachios and peppercorns; set aside in the refrigerator. 5. Spoon the meat–duck mixture into the terrine mold and gently smooth the top with the back of a spoon. Lay 4 strips bacon lengthwise across the top of the pâté. Cover bacon with remaining thyme sprigs and bay leaves. Cover the top of the pâté with 2 sheets of aluminum foil; crimp foil around edges of the mold to form a tight seal. 6. Heat oven to 325°. Transfer terrine mold to a 9" x 13" baking dish. Transfer dish to middle rack of the oven. Pour in enough boiling water that it reaches 1⁄2" up the sides of the terrine. Bake the pâté until an instant-read thermometer inserted into center reads 158°, about 2 hours. Transfer baking dish to a rack; remove foil. Cut out 2 rectangles of cardboard to fit inside rim of terrine mold. Wrap cardboard rectangles in foil and place them over pâté. Place three 15-oz. soup cans atop cardboard; let sit in water bath for 1 hour; remove. (Weighting makes the pâté easier to slice.) Refrigerate pâté (in its mold) for at least 1 day and up to 4 days. To serve, slide a knife along edges of pâté to loosen it. Invert the pâté onto a cutting board and slide a butter knife along one short edge to free the pâté from the mold. Cut into 3⁄4" slices and serve with baguette, dijon mustard, and cornichons. Whereas antipasto platters may include marinated vegetables and cheeses in addition to cured ham and sausages, charcuterie deals strictly in meat. It's more closely related to the Italian salumi platter, but with a French twist: Charcuterie offerings go beyond cured meats and sausage to include pâtés and terrines, flanked by specialty mustards, French olives and other pickled or preserved sides. The tradition originated as a way to preserve pork, but evolved to include duck, goose or chicken liver, and other meats such as veal and game. You can make a quick, bourbon-spiked chicken liver pâté up to two weeks ahead. Originally, pâtés were baked in pastry, and terrines were cooked in a special mold. Over the years, the pastry was replaced by a mold, but we continue to call it pâté. Pâté traditionally has a smooth consistency, versus the chunkier texture of terrines. The coarse-textured terrines are sold as country pâtés. They're made of artfully layered ingredients: seasoned chunks of meats such as pork, venison or rabbit; fat for flavor, moisture and preservation; and sometimes nuts such as pistachios, for texture and appearance. French salamis and sausages may look just like the Italian variety, but they're seasoned very differently. The French-style salami isn't as spicy as the Italian variety. No charcuterie platter is complete without relishes such as cornichons (tiny French-style pickles), French olives (picholine or Niçoise) and tiny cocktail onions. Other possible relishes include pickled caperberries, bottled onion chutney or relish and, if you have some left over from Thanksgiving, an onion-cranberry compote to accompany a coarse, country pâté. The idea is to balance the pâté flavors with something salty, savory and maybe even a little sweet. Melt 1 stick butter in a large nonstick skillet over moderately low heat, then cook onion and garlic, stirring, until softened, about 5 minutes. Add herbs, salt, pepper, allspice and livers and cook, stirring, until livers are cooked outside but still pink when cut open, about 8 minutes. Stir in bourbon and remove from heat. Purée mixture in a food processor until smooth, then transfer pâté to a 2 ½ -cup crock, or 4 (8-ounce) ramekins, leaving a little room at the top for the seal made of clarified butter. Smooth top with a knife. If using herb garnish, put a sprig on top of pâté. 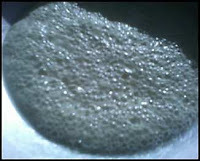 Skim froth from butter, then spoon enough clarified butter over pâté to cover its surface, leaving milky solids in bottom of pan. Chill pâté until butter is firm, about 30 minutes, then cover with plastic wrap and chill at least several hours more, preferably a day or two ahead of time. Pâté can be chilled up to 2 weeks. Once butter seal has been broken, pâté keeps, its surface covered with plastic wrap and chilled, 1 week. Recipe may be halved. Note: Though this pâté can be eaten the day it's made, it's more flavorful when made 1 or 2 days ahead. If you use several small ramekins instead of a pâté crock or terrine, you may need more clarified butter to seal the tops. As shares of publicly traded meat companies slide with the rest of the market, People for the Ethical Treatment of Animals has had to buy more shares to ensure its ability to continue its shareholder resolution campaign. PETA has long purchased tiny holdings in major meat processors in order to gain access to shareholder meetings and offer shareholder resolutions to generate publicity and further the organization's goals. Among the companies PETA has recently increased its stake in are: Pilgrim's Pride, Tyson Foods, Sonic Corporation, O'Charley's Inc., Domino's Pizza, Inc., California Pizza Kitchen and Ingles Markets. MONTEREY COUNTY, Calif., Dec 02, 2008 (BUSINESS WIRE) -- The under pressure economy has made many Californians wary of travel this Holiday Season, but dropping gas prices could cause them to reconsider in time for Christmas. The good news is that hotels, restaurants and attractions in Monterey County are rolling out the red carpets to welcome them. Nationwide, the economic decline is causing air travel this year to take the biggest hit with a seven percent drop. But thanks to declining gas prices, car travel is still a viable and cost effective option. As gas prices continue to dip - a gallon of regular gas on average in California costs $2.11, compared to $4.58 in June - traveling by car this December is becoming an increasingly reasonable prospect. "I think it would be safe to say that if gas prices continue to remain as low as they are or even drop further in the coming weeks," said Celeste White, spokesman for Monterey County Convention & Visitors Bureau, "that can only bode well for the Christmas drive travel market this holiday season. Travelers are focused on 'staycations' or 'nearcations' and because they offer the ease of travel, the lower gas prices will convince many the luxury of a much needed escape is an affordable prospect." Gas prices are not the only travel consideration, of course. The economy is certainly in the forefront of everyone's mind. There are indeed factors that are contributing to the lower price of gas and most of that has a lot to do with investment values declining and state unemployment rising to 8.2 percent. The low gas prices have been a silver lining of sorts for many consumers. And while holiday car travel is down, it hasn't dropped nearly as much as holiday air travel which presents a unique opportunity for the holiday traveler. "Traveling during the holiday season during economically challenging times also presents many opportunities to the savvy traveler," states White. "Those willing to take the time and effort will find that there are many deals to be had right now, as hotels and attractions make grand efforts to fill rooms and seats, by offering packaged deals with room nights, golf, movie tours, aquarium visits, agventure tours, wine tasting, shopping, and holiday meals, all rolled into the timeless atmosphere with the famous backdrop of Monterey Bay." December - January, visitors can slip into this sanctuary without breaking the bank. Countywide, hotels from Big Sur to Monterey have stepped up with seasonal rates. Add to that the natural rush of nature on parade, world-class wine tasting and a stint with Santa and the season is within reason. More info: www.montereyinfo.org. Come find the destination that is bursting with nature and adventures, traditional and non-traditional festivities and is the perfect place for a quick getaway. Monterey County boasts 99 miles of prime Pacific Coastline, the Monterey Bay National Marine Sanctuary, three historic missions, 40,000 acres of premium vineyards, 25 golf courses and nearly 200 lodging properties. Monterey County includes the Monterey Peninsula, Big Sur, North County and the Salinas Valley. The Monterey Peninsula Airport (MRY), just three miles from historic downtown Monterey and minutes from the area's major attractions, is served by non-stop flights to and from Denver (DIA), Salt Lake City (SLC), Las Vegas (LAS), Phoenix (PHX), Los Angeles (LAX and ONT), San Diego (SAN) and San Francisco (SFO). Visitor info: www.montereyinfo.org. Everyone's favorite hair-of-the-dog hangover cure, the Bloody Mary, turns 75 years old today, according to legend. The most popular theory has it that Fernand Petiot invented the cocktail at Harry's Bar in Paris in 1920, when it was known as the Red Snapper because it was so harsh. But he didn't transform it into the brunch drink we know today until he was at the St. Regis Hotel in New York in the 1933 and added the special ingredient: Tabasco sauce. That's when it became the Bloody Mary. "I initiated the Bloody Mary of today. Jessel said he created it, but it was really nothing but vodka and tomato juice when I took it over. I cover the bottom of the shaker with four large dashes of salt, two dashes of black pepper, two dashes of cayenne pepper, and a layer of Worcestershire sauce; I then add a dash of lemon juice and some cracked ice, put in two ounces of vodka and two ounces of thick tomato juice, shake, strain, and pour. We serve a hundred to a hundred and fifty Bloody Marys a day here in the King Cole Room and in the other restaurants and the banquet rooms." Fog raced through the streets, chilling bones and stirring up an appetite for something warming. Dinner was still several hours away, but the beauty of London is that afternoon tea starts at 3 p.m. After Christmas shopping, it’s the perfect way to relax and refresh — tea, sandwiches and a warm scone. For me, afternoon tea was the most memorable part of the city. Almost every London hotel worth its weight offers this timeless tradition. In Houston, we have a handful of places that serve afternoon tea, including the St. Regis Hotel in the Galleria area and Serenitea Tea Room in Sugar Land. The best comes at the end: a perfectly risen scone with a crusty sheath and moist, biscuity interior. Warm and fragrant as fresh-baked bread, it begs to be slathered with clotted cream and strawberry preserve. In a large mixing bowl, combine flour, baking powder, sugar, salt, ginger, nutmeg and fennel seeds. Cut butter into the flour until the mixture resembles crumbs. In a separate bowl, beat 2 eggs and cream. Stir the egg-cream mixture into the dry ingredients. Stir in cranberries and orange zest. Turn the dough out onto a floured board and press it together into a ball. If it doesn’t hold together, add water (or milk, or more cream), a tablespoon at a time. Don’t overwork the dough. Roll dough out to a thickness of 1 inch. Cut into rounds with a fluted pastry cutter. For triangular scones, turn the dough out and separate it into 2 halves. Form each half into a roughly circular shape, being careful not to overwork the dough. Then roll each half to a 1-inch thickness and cut into wedges with a knife. Prepare a baking sheet by greasing it with butter or shortening, or lining it with parchment paper. Place scones on the baking sheet. Separate the third egg and beat the egg white. Then brush the tops of the scones with the egg white and sprinkle with sugar. Bake 15 minutes or until golden. Note: Fresh cranberries are best, but frozen will work, too. Just be sure to give them a quick chop before adding them to the dough. In a large bowl, sift flour, sugars, baking powder, cream of tartar and salt. Add butter and work in with a fork or pastry cutter. Mix until flour forms marble-size clumps. Stir in currants. Make a well in the center and pour in cream. Using a fork and your hand, mix until just combined. Wash and dry your hands, then dust them with flour. Turn dough out onto a lightly floured work surface. Gently knead a few times to gather it into a ball. 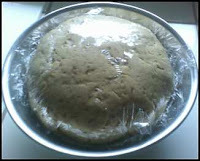 Pat the dough into a circle about 3/4 inch thick. With a biscuit cutter, preferably 1 1/2 inches in diameter, cut out circles close together. 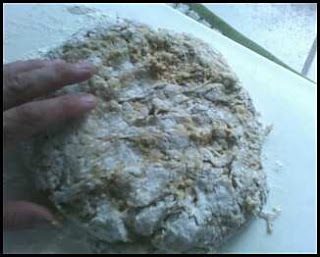 Gather scraps and pat back together to cut out remaining dough. With a thin spatula, transfer scones to a parchment-lined baking sheet, placing them 1 inch apart, and place in the freezer. A half-hour before serving, adjust the oven rack to the middle position and preheat the oven to 425 degrees. When proper temperature is reached, remove scones from freezer and brush tops with remaining cream. Bake for 12 minutes, or until light golden brown. Remove from oven and allow to rest for 8 minutes before serving. Note: You can replace currants or raisins with any dried fruit (apricots, cherries or blueberries). You can also add 2 tablespoons chopped nuts for additional texture and flavor. For savory scones, add 3/4 cup grated cheese or crispy bacon and 2 tablespoons chopped scallions. Cut sugar back to 1 tablespoon; increase salt to 1 teaspoon and butter to 7 tablespoons. Makes 10 to 12 scones. To celebrate the holidays, Heller Estate is having their annual Holiday Party at their Carmel Valley Tasting Room on Saturday, December 6th, 5:30-8pm, exclusively for their Wine Club members. This event is free for members and up to four guests. The event will feature an exclusive horizontal Library Cabernet Tasting with winemaker Rich Tanguay. They will also be featuring a "Savory and Sweet" Holiday wine pairing, which will match Heller Estate wines with some of your favorite holiday foods! Please RSVP by Friday, December 5th. Don't forget to put on your favorite Holiday sweater, and we'll see you there! Catherine Wilkinson's Gingersnap Crusted Lamb Loin Medallions with Brandied Fig Sauce quickly rose to the top of the "Best American Lamb Family Recipe Contest" for its seasonal inspiration, originality and savvy use of a budget-friendly American Lamb cut. Hailing from Dewey, Arizona, Catherine's winning American Lamb recipe is a family favorite that has been served for many holiday meals in her home. Enjoyed by the whole family, Catherine's impressive American Lamb dish is easy enough to prepare that she has time to spend with family and friends. When her grown children come home for the holidays the "always ask for the Gingersnap Lamb" and still participate in crushing the gingersnaps in the recipe, a tradition since they were young. Catherine and her family all agree, the Gingersnap Crusted Lamb Loin Medallions with Brandied Fig Sauce is"definitely part of our family traditions during the holidays." As the competition winner Catherine will receive a Cast Iron Cookware Set made by American Lambassador Chef Tim Love and an American Lamb cut of choice to serve a family of 6. The Pilgrims, who celebrated the first thanksgiving in America, were fleeing religious persecution in their native England. In 1609 a group of Pilgrims left England for the religious freedom in Holland where they lived and prospered. After a few years their children were speaking Dutch and had become attached to the dutch way of life. This worried the Pilgrims. They considered the Dutch frivolous and their ideas a threat to their children's education and morality. On Sept. 6, 1620 the Pilgrims set sail for the New World on a ship called the Mayflower. They sailed from Plymouth, England and aboard were 44 Pilgrims, who called themselves the "Saints", and 66 others ,whom the Pilgrims called the "Strangers." The long trip led to many disagreements between the "Saints" and the "Strangers". After land was sighted a meeting was held and an agreement was worked out, called the Mayflower Compact, which guaranteed equality and unified the two groups. They joined together and named themselves the "Pilgrims." On March 16, 1621 , what was to become an important event took place, an Indian brave walked into the Plymouth settlement. The Pilgrims were frightened until the Indian called out "Welcome" (in English!). Squanto's importance to the Pilgrims was enormous and it can be said that they would not have survived without his help. It was Squanto who taught the Pilgrims how to tap the maple trees for sap. He taught them which plants were poisonous and which had medicinal powers. He taught them how to plant the Indian corn by heaping the earth into low mounds with several seeds and fish in each mound. The decaying fish fertilized the corn. He also taught them to plant other crops with the corn. Alton Brown of Food Network fame will make a return trip to the Monterey Bay Aquarium's Cooking for Solutions in May, joined by renowned chef Thomas Keller as top honorees. Keller owns the Michelin three-star restaurant The French Laundry in Yountville and is considered one of the most respected and honored chefs in the country. 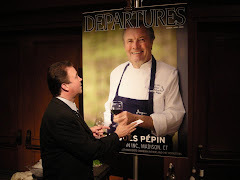 He will receive the Conservation Leadership Award — Chef of the Year at the eighth annual celebration. All proceeds support the nonprofit aquarium's Seafood Watch program, which has worked for the past decade to help transform the seafood market in ways that preserve healthy ecosystems and sustain ocean wildlife. Brown and Keller especially have demonstrated leadership in promoting food practices that protect the health of the ocean and the soil. They will join other celebrated chefs to create gourmet dishes, host food and wine adventures, and offer cooking demonstrations that feature sustainable seafood and organic ingredients. Tickets go on sale Jan. 19; Jan. 5 for aquarium members. Information: 866-963-9645 or www.cookingforsolutions.org. U.S. Foodservice (USF), Rosemont, Ill., has announced two new additions to its line of sustainable products, both made available through the No. 2 distributor’s exclusive brands division, Monarch Foods. Monogram Sustain™ is described as a line of 19 eco-conscious disposable products, including cups, plates and takeout. The initial line will utilize corn-based Polylactic Acid (PLA) and sugarcane-based bagasse fiber. All products in the line are biodegradable and can be composted by operators who have established composting programs. In addition, USF’s Rituals® Estate coffee brand has added five new blends made from beans grown on Rainforest Alliance Certified (RAC) farms. The new blends include Café Venezia, Columbian Supreme Gold, Costa Rican, Guatemalan Antigua, and Sumatra Mandehling. Coffee from Rainforest Alliance Certified farms carries and independent seal of approval to ensure it has been produced in compliance with sustainability guidelines that protect the environment, wildlife, workers and local communities. Technomic: USF seems to be leading the charge for green products. It’s a win-win bandwagon to jump on. The Federal Meat Inspection Act of 1906 made inspection mandatory for all meat that crossed state lines. In 1967 The Wholesome Meat Act required that inspection of meat sold within a state meet inspection requirements at least as stringent as those of the federal system. 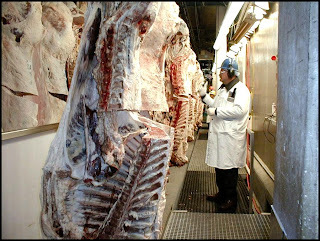 Meat inspection is not synonymous with meat grading. Meat inspection provides assurances that meat is wholesome and accurately labeled. All meat that is sold must by law be inspected. Everyone pays for meat inspection through taxes. Beef grading is optional and is paid for by meat packers and processors and ultimately by the consumer, in the price of beef. Beef is graded for quality by USDA graders according to standards established by the USDA. *No Roll carcasses are not quality graded and can be as good as any of the other grades at any time. Quality grades are determined by estimating the age of the animal, the amount of marbling (flecks of fat within the lean of the Ribeye at the 12th rib), and by evaluating the texture of the Ribeye- its color and appearance. When USDA Inspectors apply the blue grade stamp to a carcass it is applied with a rolling stamp. Hence the term No Roll for carcasses without a quality grade! Young beef with the most marbling is given the Prime or highest quality grade. Prime is usually sold to restaurants, but may be available in some specialty retail markets. Choice is the most widely available grade in the retail market. Select has the least amount of marbling. Aging is a natural process that arguably has the most impact on the flavor and tenderness of beef especially in cuts from the rib and loin. Aging allows the natural enzymes in beef to tenderize the meat by breaking down specific proteins (connective tissue) in muscle fibers. Most of the tenderization occurs within the first 7-10 days of the aging process. Two types of aging are practiced commercially: dry and wet aging. Dry aging is the process of placing an entire carcass or wholesale cut without covering of packaging in a refrigerated room under humidity controlled conditions for up to 28 days. Too much humidity allows excessive microbial growth, too little causes excessive shrinkage. If the temperature gets too high, microbial growth increases significantly. During properly controlled dry aging, beef usually loses moisture. The dry aging process also adds flavor to beef, often described as “brown-roasted beefy flavor.” Today most dry aging is done by upscale steakhouses and specialty beef purveyors. Wet aging refers to the aging of beef in vacuum bags under refrigerated conditions. Humidity control is not necessary for wet aging as the beef is tightly sealed in the packaging. Because most beef is vacuum packaged at the site of carcass cutting, wet aging is the predominant method of aging used today. By the time the vacuum-packaged beef reaches the retail store at least 7-10 days have usually elapsed. However, additional tenderization will occur with longer aging. The remaining grades of beef such as Standard, Commercial, Utility, Cutter, and Canner, are not usually sold in grocery stores or butcher shops. They are usually reserved for uses that do not require better grades of beef. They come from older cattle, and the name "Canner" sort of explains itself. 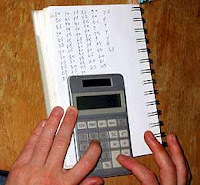 Dan Lepard delves into his address book to bring you advice from the world's greatest bakers to help you cut costs and beat the credit crunch. Read the full story here. It's Alive! 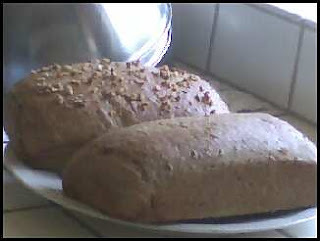 Yeast makes bread rise and helps develop the flavor. Long, slow risings will give you rich, tasty bread. Short risings leave the bread tasting yeasty. 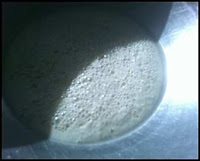 This is because a long rise gives the yeast a chance to develop flavor by eating the starch in the flour and turning it into carbon dioxide and ethyl alcohol. Pour the boiling water over the cracked wheat, cover tightly and let stand for 30 minutes until cooked. Scald the milk then add the butter, salt, molasses and honey. 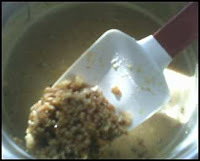 Mix in the bulgar and let cool to lukewarm then add to yeast mixture. Add the whole wheat flour and up to 1 cup of the white flour. Have your ingredient pre-measured and seperated ahead of time, it makes the process much faster. 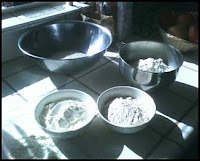 Add the rest of the flour, turn out of bowl, and knead. Kneading builds the net of protein for your bread. It will start out gloppy and end up elastic and firm. That elasticity tells you that the proteins are strong and evenly distributed through your dough. There is no right way to knead bread. However, folding the dough and pushing it down and away from you with the heel of the hand will make sure that the proteins are stretched and distributed. Knead for at least 5-8 minutes. You cannot over knead bread by hand but you can certainly ruin it by not kneading enough~"The Art of Baking"
When well kneaded shape into a ball, oil lightly and put in a mixing bowl. Cover ball with plastic wrap (like a shower cap). Let rise 1 hour. 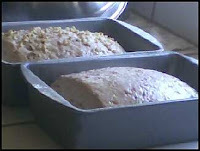 Punch down and divide into two loaves, put into greased pans and let rise until ½ inch above the rim. To see if your dough is done rising, stick a finger in the surface. If the dent does not spring back or fill in, the dough is done. If the dough collapses, it's overdone. Process orange in Cuisanart for 30 seconds. Combine all other ingredients (except pecan pieces) with orange in Cuisinart and pulse 8 to 10 times or until ingredients are coarsley chopped. Stir pecan pieces into mixture. Preheat the oven to 350 degrees F. Lightly brush the bread on both sides with the melted butter. Using a 1 1/2-inch biscuit cutter, cut out 4 rounds from each slice of bread. Arrange the bread on a baking sheet and toast for 5 to 6 minutes, or until lightly golden. Let the toasts cool on the baking sheet. Leave the oven on. Melt the remaining 1 tablespoon of butter in a small skillet. Add the minced scallions and cook over moderate heat, stirring, until softened, about 2 minutes. Scrape the cooked scallions into a food processor and let cool. Add the ginger and pulse until combined. Add the scallops and process to a paste. 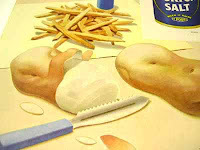 Transfer the scallop mousse to a pastry bag fitted with a 1/2-inch round tip or a plastic bag with a corner snipped off. Pipe a rounded 1/2 teaspoon of the mousse onto the toasts. Using your finger or a pastry brush, smooth the top of the scallop mousse with the ginger pickling liquid. Bake the scallop toasts for about 5 minutes or until the tops are firm but not rubbery. 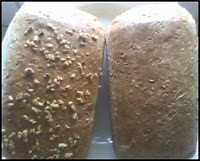 Let cool, then top half of each toast with the caviar and sprinkle the other half with the sesame seeds. Garnish with the sliced scallion greens and serve the toasts at room temperature. Somewhere in California every day of the year a potato is being grown, no other state can say that." That is how the story on Peace Corps on-line began, about Tom and Meredith Sayles Hughes who met in the peace corp and founded the Food Museum. The internet is a wonderful place. I had a specific topic I was searching, but fortuitously my search wasn't specific enough and I have found a gold mine of great vegetable articles. First I stumbled across a Harvard Buisness History Review Article about the history of frozen vegetables. At first a convienance product marketed only to the wealthy. The product was fresher than fresh unless you own your own farm. A bay area company introduced a "B" grade product into the market to compete on price. This drove the entire frozen veg market down, but introduced the product to a wider number of consumers. Along the lines of frozen vegetable marketing I was in the frozen food section the other day and saw the new line of "Health Blends" from the Green Giant. Norman Ernest Borlaug (born March 25, 1914) is an American agricultural scientist. During the mid-20th century, Borlaug led the introduction of his grain and modern agricultural production techniques to Mexico, Pakistan, and India. Borlaug is often credited with saving over a billion people from starvation. He was awarded the Nobel Peace Prize in 1970 in recognition of his contributions to world peace through increasing food supply. Now with 30 minutes of my life gone, 30 minutes that I'll never get back, Im heading back to google! I met Abe the Sous Chef at Willy's Smokehouse this morning. He had a great story about persistance. He moved her two years ago after completing culinary school in Las Vegas and applied for the Sous Chef job but was turned down. He took a server position among other jobs working at Willy's right from the beginning. "I was here before the tables" he told me. When Kurt, the previous Sous Chef left 5 months ago, he got the job he interviewed for. Now Sous Chef Abe and his wife both work at Willy's. She is the Bar Manager. A great story of persistance, and putting in your time! Jarek Molski filed more than 400 complaints against businesses claiming violations of ADA accomodations. Here on the Central Coast he put Roy's Drive In out of Business back in 2004. His was a numbers racket speculated an LA Times article. File enough complaints and some would settle out of court without a fight in order to avoid lengthy, costly trials. Similar to the way a telemarketer phone tree works, if you keep on dialing eventually you get a hit. After he finished working the businesses in Salinas he moved on to Carmel where he sued eight businesses for $1.5 Million dollars, according to the Monterey Herald. U.S. District Judge Edward Rafeedie, who has since died, branded Molski a "hit-and-run plaintiff," accusing him of systematic extortion of businesses across California. After he tried to sue a Chinese Restaurant owner in Solvang California the Judge barred him from filing anymore suits. Now the court has refused to hear his appeals. As the failing economy continues to take its toll on the foodservice industry, restaurants are changing menu options at a record pace and are willing to partner with suppliers on new items, according to foodservice consulting firm Technomic. Based on data collected through its MenuMonitor service, October saw the largest number of limited-time-offers (LTOs) and new menu items in the past five years among the top 250 chain restaurants. "With consumers cutting back on eating out, restaurants needed to find new ways to bring customers through their doors," said Bernadette Noone, Senior Program Manager at Technomic. "Many chains are using LTOs as a cost-effective way to trial new items before doing large roll-outs." Noone added that operators appear quite open to partnering with suppliers on new products with shorter lead times. Technomic identified 547 new menu items, 40 percent higher than the monthly average for 2008. Of these, 157 were reported as "back" on the menu, 197 were LTOs, and 193 were new items. By category, the largest number of new October items were lunch/dinner entrees (273 items), followed by desserts (96), appetizers (49), breakfast entrees (48), non-alcoholic beverages (29), and adult beverages (20). Side items (17), healthy items (12) and add-ons (3) rounded out the list. 2. Warm a large sauté pan over medium heat. Melt 2 tablespoons butter, then add onions and 1/2 teaspoon salt. Cook over medium-low heat, stirring frequently, until onions are soft, about 15 minutes. 3. Peel, core and slice 5 apples. Add to pan with onions. Cook on medium heat, stirring occasionally, until apples soften and begin to break apart, about 20 minutes. Add apple juice and simmer for 10 minutes. Add mustard and remove from heat. 4. Put apple-onion mixture in a blender or food processor and pulse 6 to 8 times until smooth. Keep warm. 5. Warm a very large sauté pan over medium heat. Melt remaining 2 tablespoons butter, then add shallots. Cook for 5 minutes, until shallots are soft and translucent. Stir in caraway seeds. Add brussels sprout leaves and cook over medium heat, stirring frequently, for 10 minutes. Add vinegar and continue cooking until leaves are just tender, about 5 more minutes. Season with salt to taste. Julienne remaining apple with skin on. 6. Spoon apple-mustard purée onto a warmed serving platter. Pile sautéed brussels sprouts on purée. Sprinkle julienned apple on top. Serve immediately. 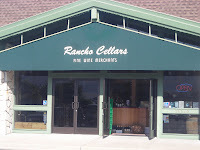 I stopped by Rancho Cellars in Carmel today and met with Janet and Jacque Mellac. They have run the fine wine boutique for a little over six years. Their vision when they opened was to provide the best and largest selection of domestic and imported wines to their customers, and currently they stock some 3000 labels on the floor for purchase, including some of the most sought after, exclusive, highly allocated cult wines, as well as a wide variety of affordable, everyday, drinking wines. 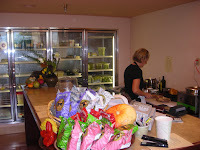 Last month Janet opened Cepage Gourmet Market and Deli taking up nearly 1/2 of the building. The menu is fantastic and the pricing incredibly reasonable. This is a place where you can eat high quality dishes, made with fresh, organic, sustainable ingredients for the price of a subway sandwich. Get over here and buy something and support these folks. In 2004, there were more than one billion steak servings in commercial restaurants alone, reported NPD Foodworld. Consumer demand for beef increased 22% between 1998 and year-end 2005, according to the Cattlemen's Beef Board. The shoulder cut was considered less than premium to the end user and was a prime candidate for value adding. 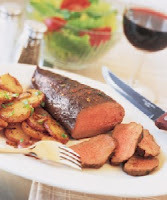 From it emerged the Flat Iron, Petite Tender and Ranch Steak BVA cuts, with tender, easy-to-prepare steaks and roasts. Want to take steak and eggs to new heights? The Petite Tender can get you there. Grill it, slice it, later it with roasted potato rounds, and serve it with a poached egg in a nest of arugula and frisée, drizzled with Warm Pancetta Dressing. It’s the best thing to happen to the center of the breakfast plate since the short stack. The IMPS/NAMP 114F, PSO1 Petite Tender, is prepared from Item No. 114 by separating the Teres Major muscle from the shoulder clod by cutting through the natural seam. This individual muscle is peeled and denuded and the surface membrane must be removed. Thickness varies from ½” to 1”.